The perfect tool for your pickup! 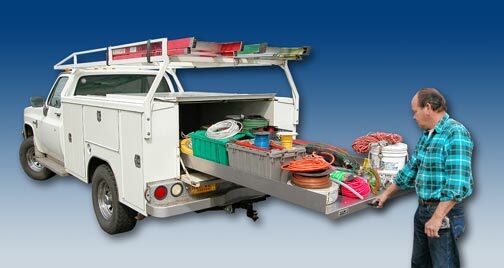 It's no fun crawling in the back of your pickup or reaching over the side to get a 5-gallon bucket of paint, a tool box, equipments/tools, groceries, or ? Especially if you have a camper shell or tonneau cover. With a Roller Coaster™ everything easily rolls out to where it can be reached! 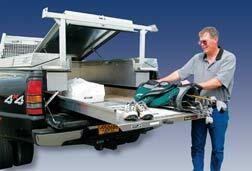 The Roller Coaster™ works great in pickup trucks, vans, service bodies, motor homes, and fifth wheel trailers. 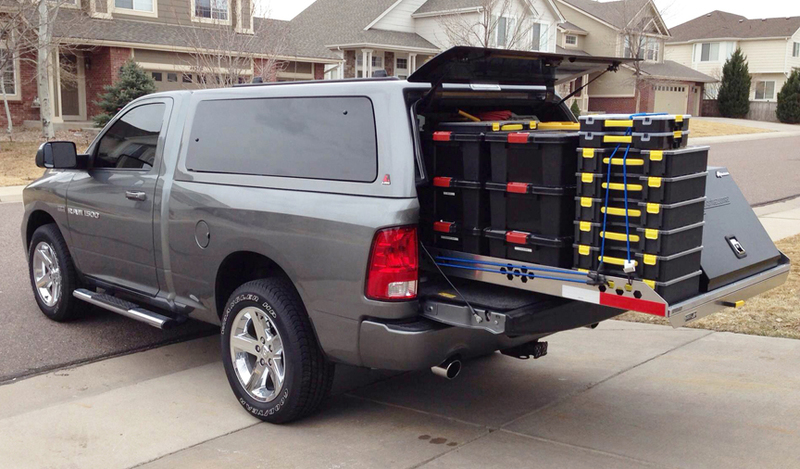 Your friends will be in awe when you pull out everything in the back of your truck with one hand. Your back will love it too! Highway Products Roller Coasters™ are built to use with pickup camper shells, tonneau covers, truck bed caps, toppers, service bodies, vans, and RV. 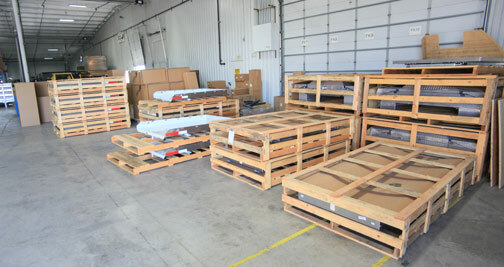 They're also called cargo slides, truckslide trays, truck bed storage drawers, and extender trays. We call ours the Roller Coaster™. Built to fit Ford, Chevrolet, Dodge, and Toyota Trucks. Fits all trucks including Ford, Chevrolet, Dodge, and Toyota. Don’t hurt your back or your knees. Put a Roller Coaster™ to work. 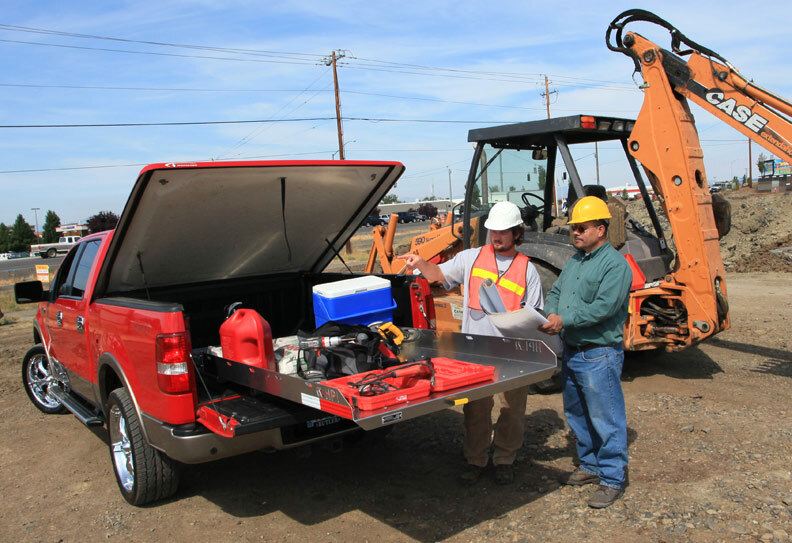 The Roller Coaster™ 2000-XT is a heavy gauge, all-aluminum roll-out cargo tray with 10 gauge galvanized tracks bolted in the back of your pickup truck. It's rated to handle up to 2,000 pounds. We're confident with that rating, because we did some extreme testing. 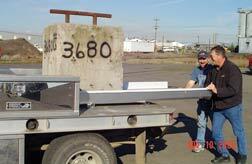 We placed our 3,680-pound testing block on the 2000 XT model. Two big men pushed the slide in and out until they were so tired they couldn't do it anymore. After the test, we took the 2000XT apart so we could examine the condition of the tracks. Results: no damage. The 2000-XT passed the first test. Then our boss took it, the same one, hunting for two weeks. If you knew our boss, he loves to test our products. He put 2,500 pounds of steel plate on it and drove it over 4x4 dirt roads, logs, bumps; tweaking it through ditches for two weeks. The guys at camp even helped by throwing firewood on top and then jumped up and down on it, trying to kill it. Test two passed with flying colors. We were ready for production. It doesn't stop there. Then came Test 3 - customer test. Our customers have used and abused the Roller Coaster™ for over 15 years now. We made a few changes there but only minor per their application. Test 4 - Every Roller Coaster™ is weight tested before it leaves our plant. 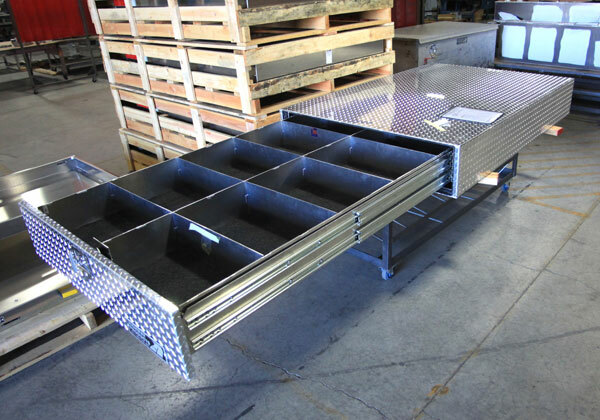 1/8th thick, heavy gauge, cargo tray engineered with marine grade aluminum. This is the same material we use on our semi truck underbody tarp and chain boxes and our aluminum boats. 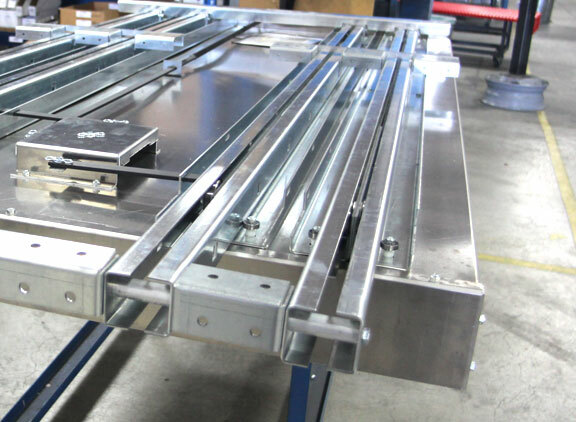 But underneath lies the secret of this goliath's strength: The tray glides on our undisputed, galvanized steel, Tee-Bone™ track system, with high impact, and sealed roller bearings. Safety locks every 10 inches of travel slam into position with our dual Stab Lock™ mechanism. This allows you to pull the bed out only as far as you need it. Let go of the handle and It automatically locks in the next position. 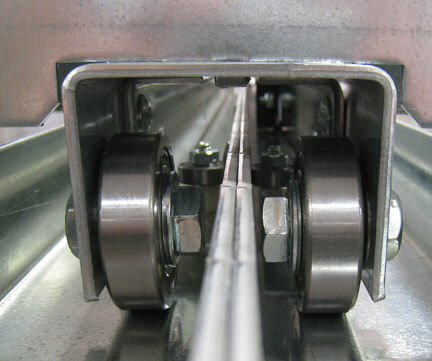 Our rugged Tee Bone™ track system. When our owner Gene Gros is not using it for his golf clubs, his wife Debby is using it to shop for company supplies. 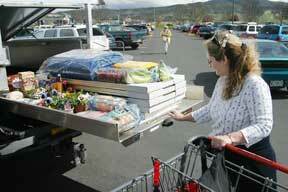 Potted plants, and groceries are common items she buys. "These supplies are so heavy," says Debby, "I love this thing!" Pull the Roller Coaster™ all the way out to get easy access to all your items, or pull it only part way out—it automatically locks in 10” increments. 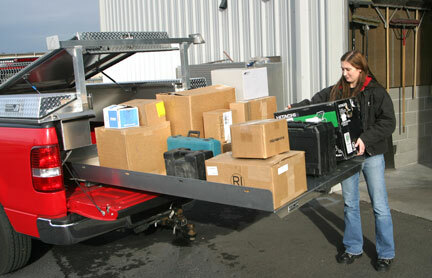 Liz Gros, our Purchasing Manager, uses the Roller Coaster™ to pick up parts for Highway Products. 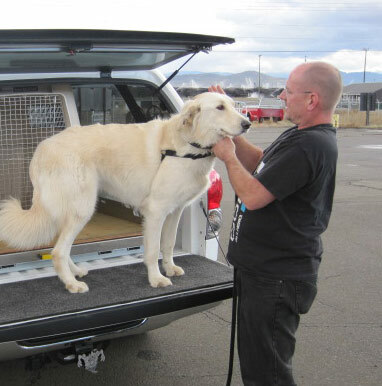 "I take our truck to town several times a week and get tools repaired and supplies for the shop. Some of these items are heavy. I like it!" Roller Coaster™ for business adds organization which means time savings. But workman's compensation, and personal insurance claims, not to mention the savings in pain from a strained muscle, or bruised knees = a good spend. The Roller Coaster™ not only works great on the job, it's like having an extra helper at home. Pack up a load of potted plants, take the family on a camping trip with coolers, tents, and chairs. We often avoid doing fun things because of the time and trouble it takes to put it together. You can easily see, the Roller Coaster™ will become a big part of your home and family fun too. Uses for the Roller Coaster™ are endless. 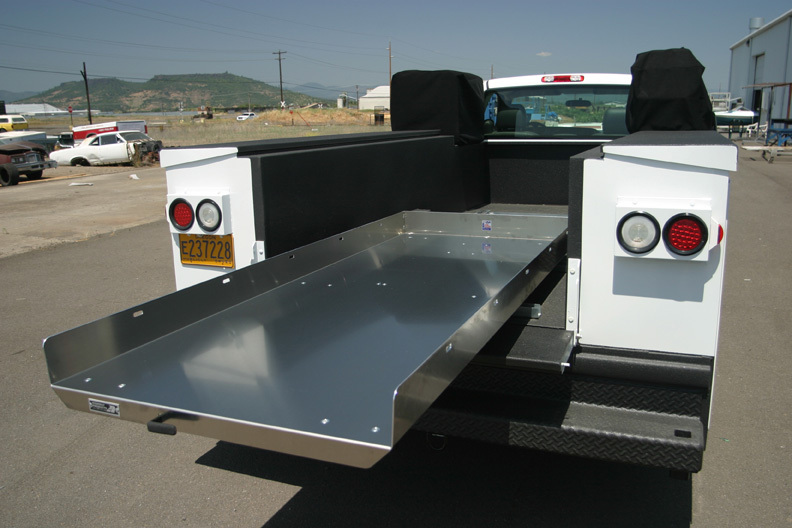 What do you carry your pickup bed that could roll out? We built the Roller Coaster™ for hard working people that need organization. Got a service body? If so, you probably wish you had a Roller Coaster™ right now! Take a look in the the back of your truck. It's a mess, right? Of course it is. They all are. Because it's a pain to get up there. And, what do you do once you get there? A phone call is all it takes to fix that. It's the best thing you can do for your company or yourself with the least amount of money and effort. You'll have access to all your tools in seconds. Got special tools? We can build racks, shelves, and compartments to hold them. It's obvious, it's a time saver and an organizer. You can order one online right now or call our sales staff to order or ask questions before you order. We even have an after hours and weekends phone for your convenience. 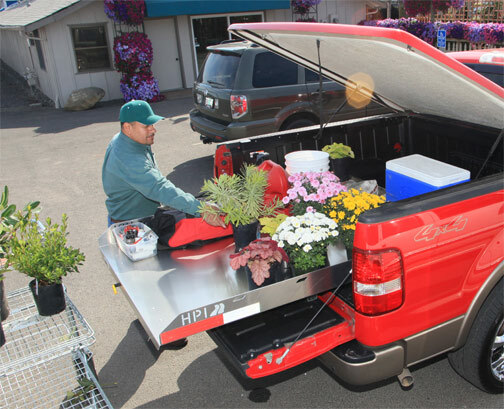 The Roller Coaster™ compliments your tonneau cover by allowing you to take full advantage of the space you have without ever having to crawl on your hands and knees. You've got a brand new, 40+ thousand dollar pickup truck, and you have to humiliate yourself every time you want something in your bed #$%^&? Pickups with canopy's are perfect for a Roller Coaster™. You can't reach over the sides, so you have to crawl in the back. With a Roller Coaster™ everything rolls out to where you can get it. 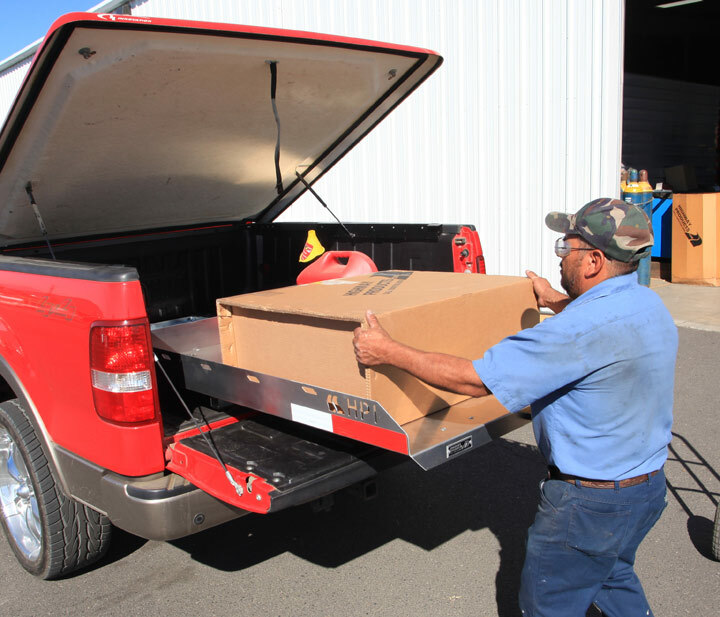 You save your knees and your back from awkward lifting positions, it's also safer because you're not jumping out of your truck bed. • Get to the cargo you want. You'll find yourself using your pickup bed more often than you ever have with a smile of satisfaction every time you do. We guarantee it. Want to hear more? Listen to Steve, below. "My back ain't what it used to be!" Steve Henry, is a local electrician. Steve says, "You should have seen the back of my truck before I bought the Highway Products, Roller Coaster™." "Now I have access to all my wire and tools. Some of the things I carry, like copper wire, are heavy and my back ain't what it used to be. Plus, I can even find things now. It's great! How come they didn't have these things when I needed them years ago?" Work smart. Be safe. Let the Roller Coaster™ ™2000-XT do the hard work! 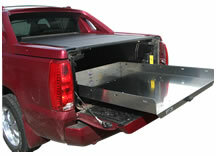 Provides secure, easy-access to heavy items transported in your pickup. Heavy Gauge™ 1/8” aluminum slide-out tray. Rated capability: 2000# & 4000# pound models. Smooth gliding action on the Tee-Bone™ track system. Secure positioning with the dual Stab Lock™ locking mechanism with six locking points. Installation kit and instructions included. The Roller Coaster™2000-XT & 4000-XT comes with a Lifetime Warranty. 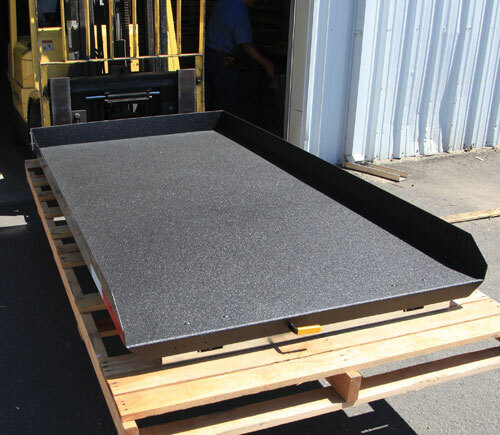 Every unit weight tested before it leaves our facility. Have an Avalanche, Escalade, or Suburban? 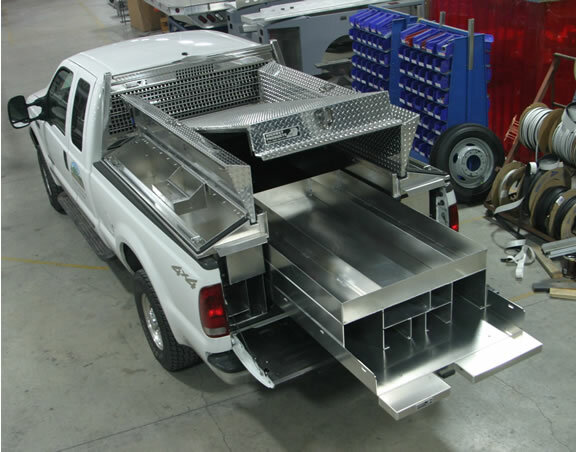 We make sizes for all vehicles and are happy to custom build units just for you. The Roller Coaster™ is a great addition to these unique SUV's. Simple no-drill installation makes this unit a must for making your rig even more efficient. As shown below, equipment can get heavy in a hurry. We took the tracks from our rock solid XT2000 "Roller Coaster" and doubled-down to make our XT4000. Listen to the problem Chris had, below. It was unpractical for Chris to unpack his whole truck to show that one tool located in the front. Our customer, Chris, sells high tech rescue equipment to fire departments and other rescue facilities in the North West; specializing in heavy duty cutting and prying equipment to cut cars apart in accidents. 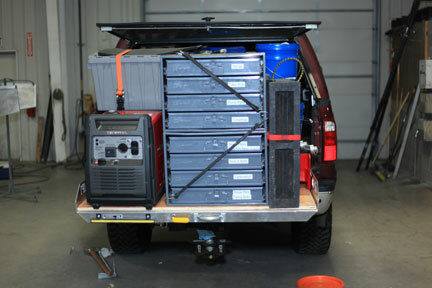 He also carry's a generator (placed on the back), boxes of tools, 5 gallon containers of fluids, and extra parts for the rescue equipment he sells. Carrying in the neighborhood of #2500 pounds, it was unpractical for Chris to unpack his whole truck to show that one piece of equipment. Seemingly always located in the front. After looking around at other brands, Chris picked our XT4000 Roller Coaster™. This allowed him to roll his equipment out and pick the pieces he needed to show at the time. The XT4000 fit the bill and proved to be a real time saver. This also allowed Chris to make a few more stops each day. Not only did chris have an F-350 pickup, he also had to put helper air bags on his truck to handle the load. Doesn't' look like there's much room left, does it? As you can see, Highway Products builds only the highest quality products. They're all made in the USA and we stand behind them 100%. Our secret to success, build them the American way; tough. Constant testing and inspections assures our commitment to you and our products. Important note: Every Roller Coaster™ passes through three inspections before each is physically stress tested with "Big Bertha". After a final visual inspection, it goes in a crate; ready to work. 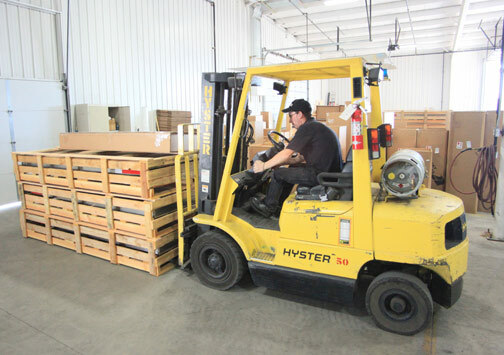 Trust and value are our biggest asset at Highway Products. 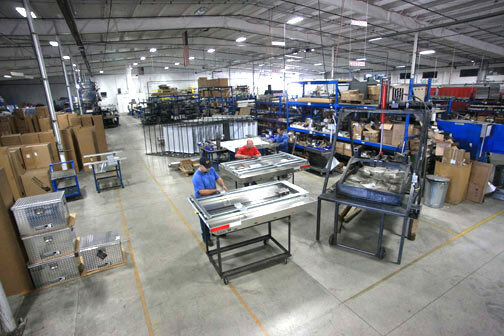 Constant testing and inspections assures our commitment to you and our products. Roller Coaster™ being stress tested at each lock position (every 10 inches) until it reaches it's full extension. Our popular "High-Sides" option gives you even more versatility by adding a valuable 15 inches of extra load carrying capacity to your new Roller Coaster™. 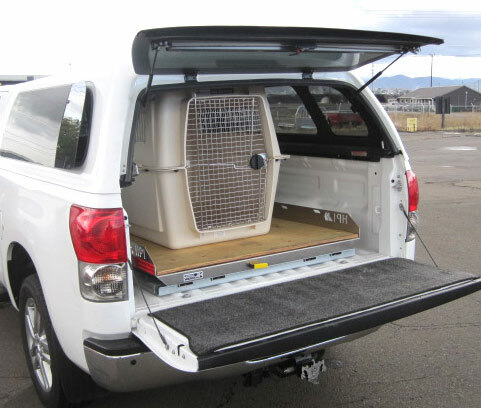 As a bonus, it does double-duty by preventing cargo from falling off the back during transit. 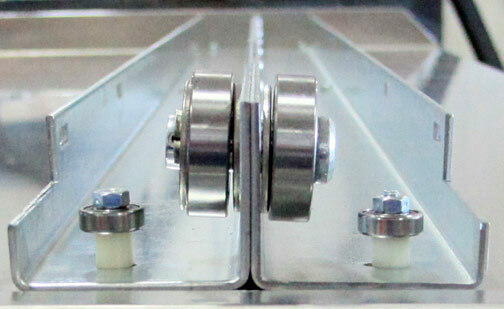 The "High-Sides" are built with the same rugged 1/8th thick aluminum the Roller Coaster™ tray is made of. Free Shipping! "High-Sides"- if ordered with the Roller Coaster™, there's no additional shipping cost. Measurements - Sides & back are 15 inches tall. Width depends on the model. Length from back to front is 58 inches. Easily bolts on when you get it. Bolts included. Order or ask for the Roller Coaster™ "High-Sides". 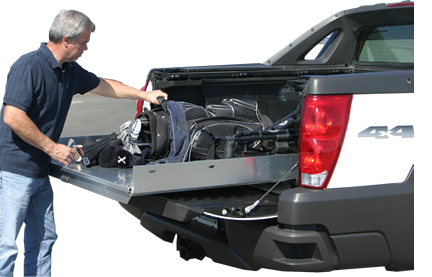 Here's an option you can use to carry a spare tire or have a second level to carry more goodies. This tray measures 49 inch x 37 inch front to rear and can be positioned to the rear or the front of the bed. You can also add this tray to the "High-Sides" option to get the most out of your storage system. Got some ideas of your own? We can do that too! 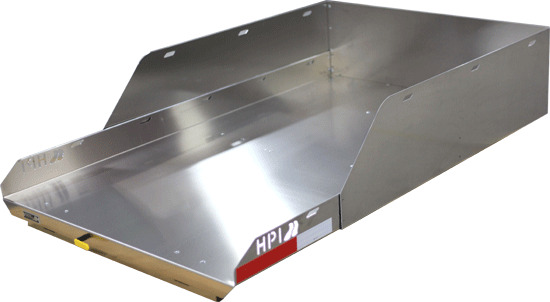 Highway Products means custom built products. We're not saying you need this feature. 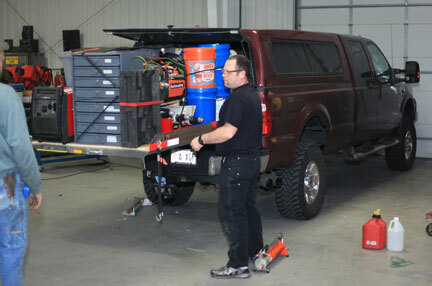 We offer it because you may already have this done in your truck and want your Roller Coaster™ to match your truck bed. (Left) This picture shows a custom built Roller Coaster™ for our surveyor customers. We call it our "Surveyor Pack". It's built to hold tripods, stakes, and other tool of their trade. We can also personalize your Roller Coaster™ with compartments to fit your needs. 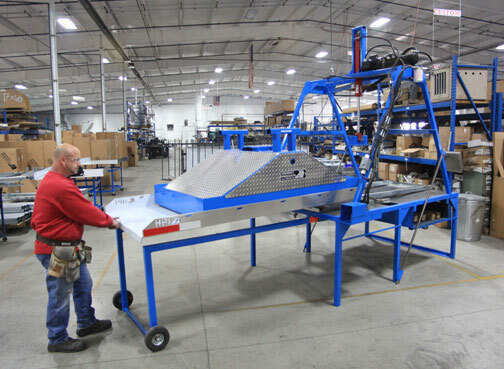 Our Roller Coaster™ also works well with our Service Bodies and Pickup Packs™. 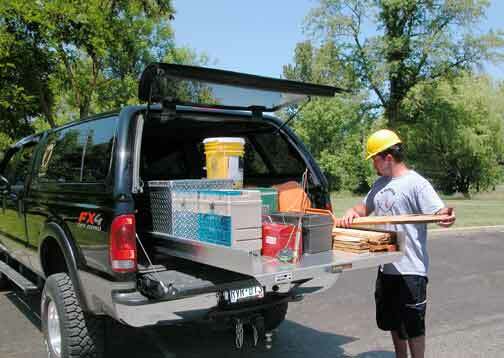 Take a look at our "Surveyor Pack". 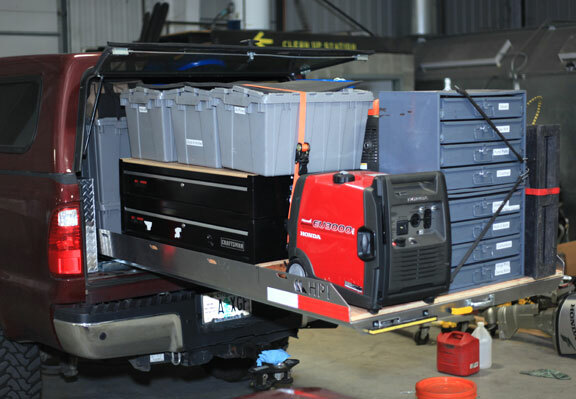 (left) Another example of a custom Enclosed Slide-Out Storage Drawer™ built to our customer specs. He asked for our Storage Drawer™ with dividers and enclosed for security with our Tee Lock system. 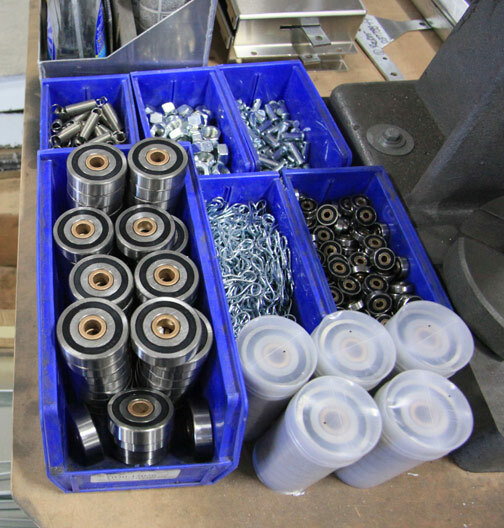 Our computerized ICS (inventory control system) automatically issues a new work order to the shop floor when we get to a predetermined minimum quantity. This gives our sales team the advantage of having our most popular items always in stock or in production for fast shipment. Best buy for your money! Here's why. (1) It does what we say it will do. (2) You get FREE lifetime replacement warranty - All moving parts of the Roller Coaster™. This includes the bearings, locking mechanism, and track. That's right! Even if you have absolutely abused this unit, all moving parts are covered with FREE replacement as long as you own it. (3) Every unit factory tested. (4) Absolutely NO PLASTIC. You can't give a lifetime warranty with plastic! Roller Coasters™ are made to live outside in sun, rain, snow, hot, or cold. As we know, plastic can't handle the elements for long. (5) Best engineering. Weighs 25% less yet carries more weight than any other brand. 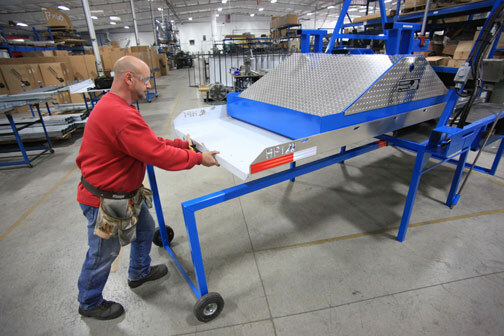 We know you will love the Roller Coaster™ Because for years we've used it ourselves here at Highway Products. So, if you're ready to start enjoying your truck, van, or RV more than ever, we invite you to call or go online and order one today. As promised, we want you to be 100% satisfied or we'll give you your money back. But more important, we know you will love the Roller Coaster™ and even brag about it to your friends. Our Friendly Sales Staff are Ready to Assist you. Got Questions? Need Something Special? Ready to Order? Call Toll Free 1 800 866 5269. Best Buy for Your Money, or Your Money Back!